Malarky took me by surprise. It made me laugh, it shocked me, and it made me squirm with discomfort. By turns, it was shockingly raw, achingly funny, and absurdly bizarre. How can a book that deals with grief and loss, and the journey to re-define yourself under new circumstances be all of these things? Because, life is sometimes like that. The protagonist, known as ‘Phil’ or ‘Our Woman’, is going through a rough patch (to put it mildly), and we find her in many awkward and absurd situations. Despite concern for her own behavior, she is unapologetically candid about her thoughts and acts on them with determination. Our Woman has had several shocks to her system in recent years; she comes upon her son “doing unmentionable things out by the barn”, her husband’s mistress seeks her out to let her know what her husband has been up to, her husband and son cannot get along and she finds herself caught in the middle, and now her son has joined the army. So, what is she going to do about all this? Why, find herself a man to do her own unmentionable things with, of course. Who is this woman? And where has she come up with such bold ideas on an average Sunday where Mass and refilling the milk jug and sugar bowl, lest there be an avalanche of visitors were previously the order of her day. This book is not an easy read; you have to concentrate both on the language, and the time jumps. 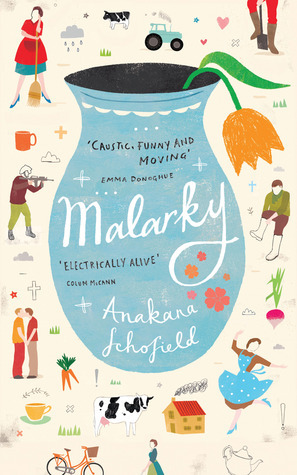 But, if you are feeling adventurous or you want a change of pace, something a bit quirky, then I would highly recommend Malarky. From the first page, I was delighted by the writing, and the antics of Our Woman. In response to this burst of punitive activity, she told the gang she was busy the next two days. An unusual move to startle them, for not a day passed that several of them didn’t meet. They were like tight ligaments in each other’s life, contracting, extending and sustaining the muscle of each other, house to house, tongue to ear. Joanie said I was to lock the door. I had to remember. Bina said if I didn’t lock the door she’d personally come down here and attack me herself if only to teach me to lock the feckin’ thing. Still I didn’t lock it. There was no particular reason, other than the matter of them both telling me, I had to let them know just because I was a widow I wouldn’t have anyone telling me what to do. Her very worst picture, that, of people who live together rolling along, rolling through the century and no matter how they try or don’t try, wake up decades later to the realization they’d been quietly making each other miserable. And she was surprised at how unsurprised she was. … she did not understand the version of life that presented itself yesterday at the B&B. She didn’t recognize the hat, nor face, nor fingers on it. She hadn’t been trained for this. She’d been trained for marriage and funeral and baptism and weeding and shifting and turning, but not wondering. This wondering was new for her. The wondering of why she didn’t understand how to wonder. She did wonder but she was not officially certain how to do the wondering. Most of all, she hadn’t paid attention. It’s worth a few minutes of your time to go have a listen to Anakana Schofield reading from her book at Goodreads. Also, go check out Laura’s excellent review of this book at Reading in Bed, as well as Matilda Magtree’s equally excellent non-review. I got so much (and different things) out of both of them. 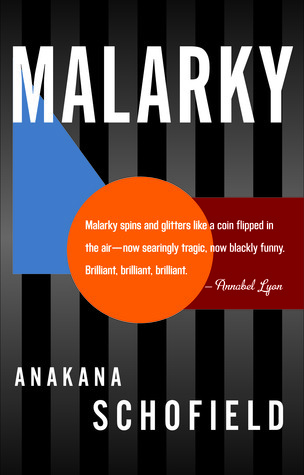 Laura is the one who urged me to read Malarky in the first place. And, it is worth the read just to get to that brilliant last line! 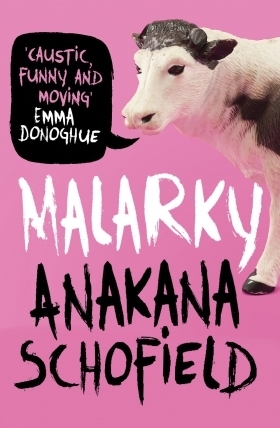 “… if you are feeling adventurous or you want a change of pace, something a bit quirky, then I would highly recommend Malarky.” How can I not want to read this, right now? Sounds like something I would love. Onto the too-read list it goes. Thanks for the heads up, Naomi! Oh good! I would love to hear what you think of it! That’s the way I felt after reading Laura’s review. This reminds me of “The Stranger” by Albert Camus. The protagonist does not deal with his mother’s death the way the community expects. You are just full of good recommendations! I was curious about this book after Laura’s review, but now extremely curious! It sounds like it definitely made an impact on you. This one sounds pretty good, too! I loved that quote about the group of friends too. “Tongue to ear” made me do the reading equivalent of a double take. Wait… what? I’m so glad you loved the last line too! A devastating last line is one of my favourite bookish things. Now that I know someone who’s read it: what was her young man(name escapes me) trying to achieve with all the questions and prodding and what not??? I never did figure it out!! The author was going for that effect, maybe, just utter absurdity? I wondered about that, too! The best I can come up with is that making him seem a bit strange in his own way maybe made it easier for us to believe he would become involved in such a ‘unique’ relationship with a much older woman. It also made the situations more comical. Did you find that the time jumps were sometimes confusing? I think it would be a good candidate for a re-read. And, I just have to say that I thought the descriptions of the interactions between her and her husband were brilliant. This sounds great! It is not easy to find books that are literary, quirky, and funny. And I like that the last line is brilliant – that’s pretty encouraging, to know that there is a satisfying conclusion to look forward to! This is a great book to read if you’re feeling adventurous, or in the mood for some dark humour. I want lots of people to read it, so I can find out what they think!